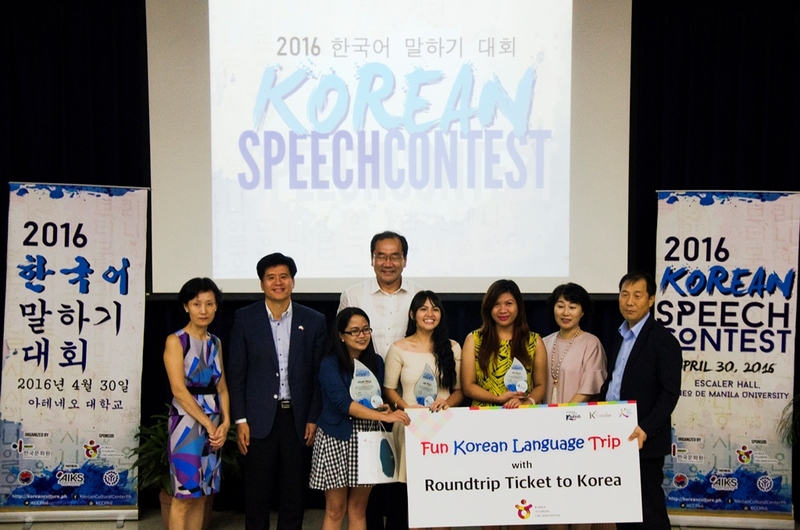 April 30, 2016 marked the Grand Finals of the 2016 Korean Speech Contest organised by the Korean Cultural Center (KCC) in partnership with Ateneo De Manila University. Contestants from six cities of the Philippines who won the semi-finals of their respective areas came to fight it out in a battle of words and win special prizes awaiting the top three finalists. The program started with welcoming remarks from Dr. Fernando Aldaba, Ateneo De Manila’s Dean of the School of Social Sciences, and opening remarks from Director OH Choong Suk, the Counsellor of Culture and Public Relations of the Korean Embassy and also, the Director of KCC. 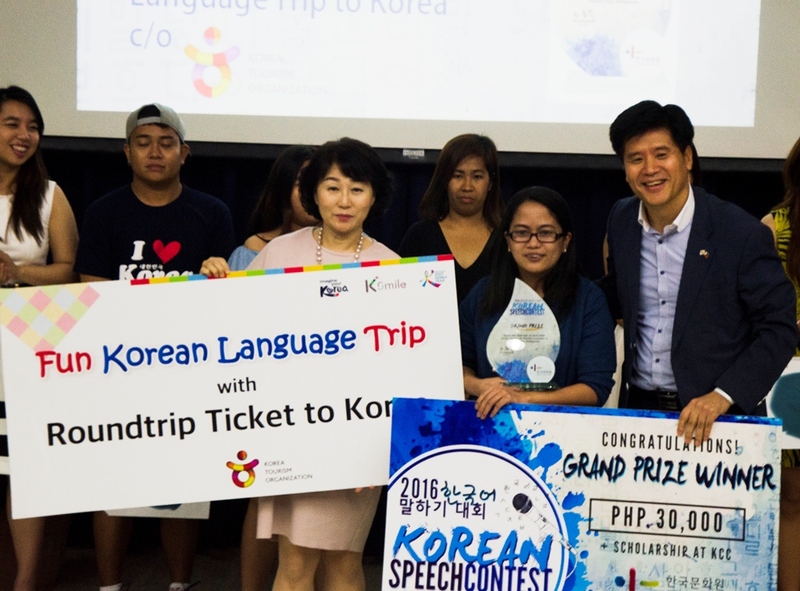 The 2016 Korean Speech Contest Grand Finals truly tested the finalists since they must fully memorize their speeches without the need for cue cards or coaching and must not exceed the five-minute time allowance given to them. They were evaluated based on content, delivery, stage presence and ability to answer a question from the board of judges which was composed of Director OH Choong Suk; Madam LEE Jongmin, wife of Ambassador KIM Jae Shin of the Embassy of the Republic of Korea; Director PARK In Shik of the Korea Tourism Organization; Mr. KIM Jongho, Principal of the Korea International School; and Ms. LEE Jonghwa, a professor from the University of the Philippines. The impressive roster of contestants were from various ages, backgrounds and occupations. Five of them were college students — Christine Dizon, Francesca Magnayon, Janine Laddaran, Samantha Logarta and Jann Caitlin Jao. Two were teachers from different cities — Rachel Doculan and Eden Padron. The rest were from Tacloban, Davao, Iloilo and Pampanga, respectively — Angeli Baclea-an, Czaryna Bautista, Michael Braga and Antonio Suarez. Each of them shared how they went through different experiences and life situations their love for Korean culture helped them grow as better versions of themselves with big dreams for the future. In between the speeches, special presentations and performances were given by Ms. Maria Concepcion Loren Chua, the winner of last year’s Korean Speech Contest; Mr. Rafael Casimiro of Ateneo De Manila University and Ms. Jean Kiley Manguera, the winner of the 2014 Pinoy K-pop Star Singing Category. Raffle prizes were also given away to lucky audience members who came to watch. Finally, the winners of the 2016 Korean Speech Contest were announced. The 3rd place winner who got to take home Php10,000 cash, a trophy, a scholarship package and a goodie bag from KCC, was Ateneo De Manila University’s Janine Laddaran who pointed out important lessons in life which she learned during her exchange experience in Korea through her piece, “Stepping Out in the World One Step at a Time”. The 2nd place winner who received Php15,000 cash, a trophy, a scholarship package and a goodie bag from KCC, was Philippine International College’s Christine Dizon who expressed how the obstacles she experienced early in life helped her to not give up and to grow step-by-step with her speech entitled, “Let’s Make an Effort to Grow”. And, of course, the grand prize winner who was awarded Php30,000 cash, a trophy, a scholarship package and a goodie bag from KCC, plus a 7 days/6 nights Fun Korean Language Trip to Korea courtesy of the Korea Tourism Organization, was none other than Angeli Marie Baclea-an from Tacloban City who touched the hearts of the judges and the audience with her touching story of how her knowledge of the Korean language changed her life and gave her a purpose to live with her winning speech, “The Typhoon That Changed Me”. The 2016 Korean Speech Contest was truly an avenue for people from all walks of life with a passion for Korean language and culture to share their personal growth experiences and showcase their mastery of the language. 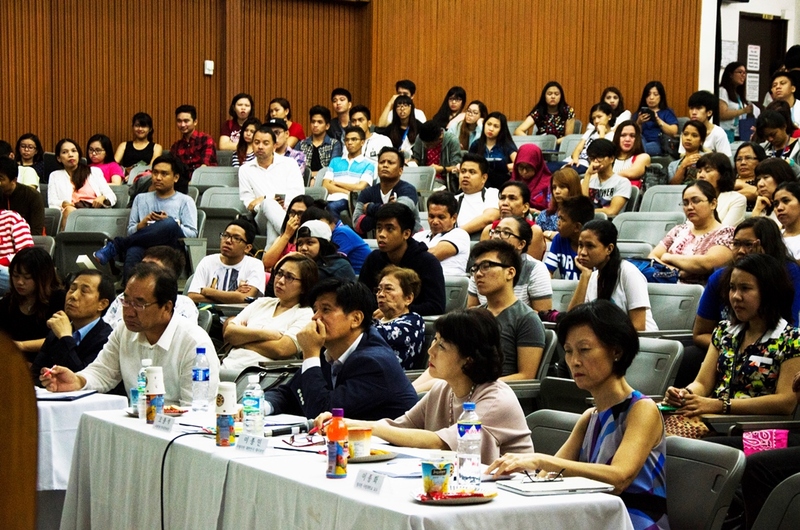 Surely, each one in the audience were inspired to not just learn the Korean language, but also to keep on pursuing their passions and to view challenges as opportunities to grow and achieve their dreams.